“It felt good to be out there, playing hard, playing in games that matter,” said forward Shawn Matthias. Matthias had just come off of the ice Wednesday night after playing his first game with the Colorado Avalanche. 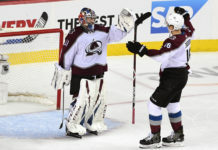 On Sunday, he was acquired by the Avs from the Toronto Maple Leafs; quickly going from a team that was competing for the first overall pick in June’s draft, to a team competing for a playoff spot. 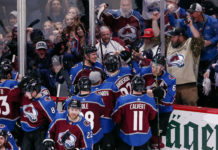 It did not take long for Matthias to endear himself to his new teammates, as he scored his first goal in burgundy and blue 13 minutes into the first period, tying the contest against the San Jose Sharks 1-1. Interestingly enough, Nick Spaling, whom the Sharks acquired from the Leafs this week and who was also making his debut for his new team, opened the scoring. It would take extra time to decide the game, but the Avalanche would prevail 4-3 in a shootout. Matthias spent the night on the Avalanche’s third line, alongside Carl Soderberg and Blake Comeau. The trio was effective, with Matthias giving his linemates credit for making his debut go smoothly. It has been a tumultuous week for Matthias. After learning of the trade, he spent the next couple of days trying to work out some issues with his visa. After getting all of that cleared up, he hopped on a plane, arriving in Denver at 1 a.m. on Wednesday. One of the big adjustments for Matthias was indeed the altitude, something that proved more difficult than he anticipated. Despite the lack of oxygen, Matthias still had an effective start to his Avalanche career (hopefully taking the first step to breaking the dreaded curse of the number 18). 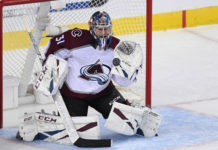 He showed what he is capable of bringing to the table, giving head coach Patrick Roy reason to be excited about the possibilities his addition may open up.